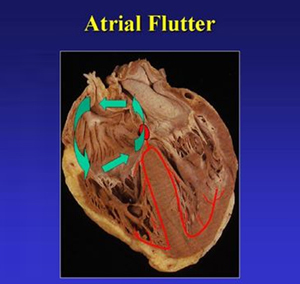 Atrial flutter (AFL) is very similar to atrial fibrillation. Both conditions are types of supraventricular (above the ventricles) tachycardia (rapid heart beat). In atrial flutter, the upper chambers (atria) of the heart beat too fast, which results in atrial muscle contractions that are faster and out of sync with the lower chambers (ventricles). Atrial flutter is caused by a single electrical wave (“short circuit”) that usually circulates very rapidly around the right atrium (upper chamber) of the heart in the exact same pattern over and over. Because the electrical signal that causes AFL circulates in an organized, predictable pattern, people with atrial flutter usually continue to have a steady heartbeat, even though it is faster than normal. (In Atrial fibrillation, on the other hand, the electrical signals are chaotic and irregular, causing the atria to spasm and quiver. On the other hand, people with A Fib may feel that the heart is skipping beats, or the pulse is “out of rhythm”). In AFL, the too-rapid heartbeat is sometimes felt as a “fluttering,” or tremor-like sensation in the chest. It is important to realize that only the muscular ventricles are what a person feels beating; most people are not aware of the thin-walled atria which produce very weak contractions. Some patients have no other symptoms, but others may feel shortness of breath, fatigue, dizziness, or even fainting. AFL can last for days or weeks at a time. Most people with AFL require treatment to interrupt the abnormal circuit and slow the heartbeat back down to its normal rate. With proper treatment, AFL is rarely life-threatening. But, like atrial fibrillation, AFL may increase the chance of having a stroke. This is because when the atrial muscle is not contracting properly, it cannot pump blood forward into the ventricle. Some of the blood stays in the atrium for longer than normal, and may form stagnant pools. Pooled blood that is not constantly moving is more likely to form clots. A blood clot can break off and travel to blood vessels in the brain. If a clot blocks the blood supply to the brain, the result is a stroke. In addition to the risk of stroke, if the ventricles beat rapidly for a long time (for many days and weeks), the heart muscle may weaken. This can increase the risk of more serious heart disorders such as heart failure. The normal pumping of the heart is controlled by steady electrical signals produced by the heart’s natural pacemaker, the sinoatrial (SA) node, located in the right atrium. 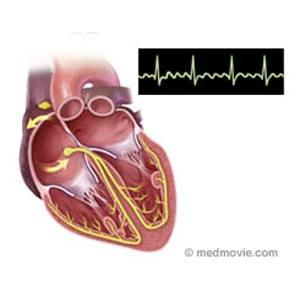 The SA node sends signals across the atria to the atrioventricular (AV) node. The AV node is the electrical “gate” or “junction box” that receives the signals from the atria and passes them along to the ventricles. When the AV node receives signals that are too rapid, such as in atrial flutter (and A Fib) its job is to slow them down so that there will be enough time for blood to enter the ventricles before the next beat. Frequently, the AV node is not able to filter out enough signals and the ventricles still beat too quickly during AFL or AFib. When this happens, medications are needed to slow the pulse even further. In AFL, the AV node at least partly compensates for the abnormal fast signals coming from the atria by blocking some of them, so that only a fraction (typically one-half to one-quarter) reaches the ventricles. Even though the electrical signals from the atria may be as rapid as 300 beats per minute, a person with AFL will usually have a lower pulse rate (from 75 to 150 beats per minute, depending on how many signals get through). Nonetheless, the pulse rate often is abnormally high (a normal pulse for an individual at rest is about 60 to 80 beats per minute) and most patients will experience some symptoms from the faster heartbeat. One of the important initial treatments for AFL is to take medications that block more of the signals at the AV node, so that the pulse slows down to a more normal pace.